Usually a church wants to fill up its pews with people . 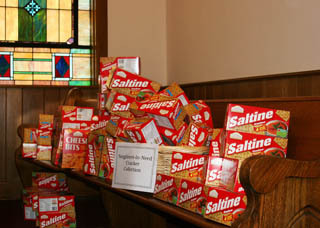 . . but Marshall Presbyterian is hoping to fill up a couple of pews with crackers for Neighbors in Need. Every month the Church collects a specific item forNeighbors in Need. The current economic crisis has created significant funding challenges to the Neighbors in Need program, especially in regards to helping families cope with rising fuel oil and utility bills. As such, Neighbors in Need will hold a food drive at both the Marshall and Mars Hill Ingles stores this Friday and Saturday, November 18 and 19 to help fill the pantry shelves. Jazz musician Steve Davidowski will also present a concert at Marshall Presbyterian Church in December to further help fund the program. The general public is invited, and, if you've ever been to one of Steve's performances, you know that it's a fun-filled Christmas concert definitely not to be missed.